Junk and Rubbish Removal Services in North Carolina. At 1844-Junk-Rat – junk and rubbish removal in North Carolina is made easy… because we do all of the work! Do you need last minute junk removal service in North Carolina area? We are the pride of the area and offer miracles at the last minutes. If you need junk removal, yard clean up, basement clean-outs, REO work or construction debris removal services performed quickly, 1844-Junk-Rat.com offers both next day and same day services. That means you can call our office anytime during working hours to get your project started. 1844-Junk-Rat.com is a full service eco-friendly company that is dedicated to taking care of the earth, we make sure to donate or recycle at least 60% of everything we haul placing us at the top of green hauling companies across the nation. You will smile when arrive at your commercial or residential location since we offer the most efficient, stress-free, courteous and friendly junk removal service you have ever seen. 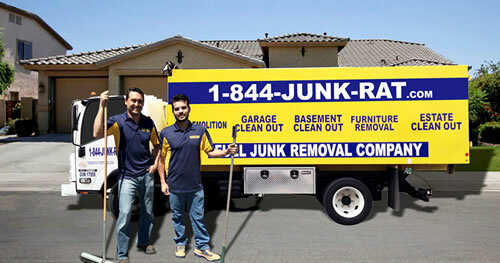 Call 1844-Junk-Rat.com today for your no obligation quote on your junk removal project. Running an a no-profit in a popular urban city center can be a daunting task that generates not only a lot of cash for the cause but also large amounts of paperwork and junk. Like we do every year, our non-profit took a weekend to clean out the whole office. Needless to say, there was more than a little junk that needed to be hauled away so we phoned the guys over at 1844junkrat.com/. Like always, their scheduler was very polite and courteous on the phone, she also made sure to set up a time that worked for us since most volunteers have regular jobs during the daytime hours. We knew that 1844junkrat.com/ recycled which is one of the main reasons we called them for our Office Clean Out. The second is their affordable rate scale. And the most important is the fact that they handle all the manual labor for you. Believe me, after piling everything up form all points, I don’t think any of us could manage to load a truck. Great service, great rates and prompt arrival, we will certainly use them again soon!